One year ago, on a Thursday night much like today, Snow White's Scary Adventures at Walt Disney World closed forever and marked the end of an era not only for the theme park but also for my family. From the spring of 2002 through the spring of 2012 we had spent countless hours on and around that ride, and had watched Ben slowly evolve from "fevered obsession" to "comfortable safety blanket", and then it all went away forever. On the upside, that final night of operation on May 31st, 2012 was a remarkable night that will live in our memories forever. On the downside, Ben lost his favorite thing in the world with no way to really understand why. And so, the most common question I get is, "How is Ben doing now? Is he over it?" The short answer is, "Yeah, mostly." As usual, the long answer is a little more complex and nuanced. As I have already written about, the first few months after the ride closed were pretty difficult. That very first time that Ben visited the Magic Kingdom last June and came face-to-face with the blue construction wall was heartbreaking in the truest sense. He paced the entire wall looking for a way to get inside, and then walked away in the drizzling rain holding on to his mother's hand as his shoulders sagged and his head hung low in sadness. It was a Charlie Brown moment if ever there was one. Over time he seemed to get over it, and by winter he stopped even going by the old location of SWSA. By all appearances he had fully comprehended and accepted that his ride was gone forever. Throughout summer and fall we watched the New Fantasyland expansion blossom into reality, and Ben checked out each new attraction and themed area as they opened up. He was not particularly impressed with the new Dumbo spinners, but he did like the newly-themed train station. The one time he went into the new Belle meet and greet he seemed to really enjoy it, and when the new Little Mermaid ride finally opened he adored it. While I thought that Ben was finally completely over the loss of his ride, in the past few months he has been asking about it again. He looks at the pictures, he watches videos of it on YouTube, and on a recent visit to the Magic Kingdom he even gave me a hopeful look and asked, "Go see... Snow White...?" My heart broke all over again at that request. Because of that, we are not specifically doing anything with him tomorrow to commemorate the one year anniversary of the ride's passing. As a matter of fact, tomorrow will be spent on a field trip to Sea World with his class. I hear the new Antarctic exhibit is open, so hopefully he will enjoy seeing the penguins. I guess it is a fitting sign of moving on, while still feeling the loss. I don't think it is exaggerating too much to say that it is like mourning the death of a loved one -- the pain is no longer acute, but there is still a hole left behind that will never really be filled no matter how much time passes. 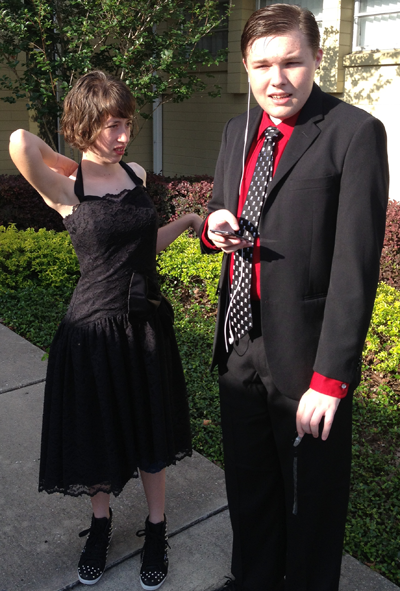 In happier news, Ben went to Prom last Friday with his girl Madeline. I don't know that they actually have any romantic feelings towards each other, but they do both enjoy spending time together and they make a dang cute couple. Ben got dressed up in a brand new outfit that is mother helped him pick out, and Madeline wore a lovely black dress that matched perfectly. It was a bit like herding cats in order to get a photo of them together before going in to the dance, but here it is. My little man is not so little anymore. This Blesses my heart. Ben is so handsome and looks to have a beautiful soul. Thank you for sharing this update. I read your book in less that 24 hours and just had to friend you on Facebook. God Bless you and your family. I have read and reread and forwarded and earnestly told strangers on trains all about your family and Disney and all the deep and wonderful emotions your chronicling of Ben's journey with Snow White and her Scary Adventures have evoked in me. One of my dreams is to be able to work at my local Disney park, Disneyland, and (hopefully as a Friend of a face character) connect with guests to make their visit to the park special and magical, regardless of whatever is going on in their life outside. Your story and others, as well as my own experiences growing up going to the park are truly inspiring. The cast and crew at Disneyland and Walt Disney World (and all locations around the globe) have always been a fantastic group of people who work their hardest every day to make life magical for all who come to visit, in the true spirit of Walt Disney. I am so glad to hear that you are all doing well in the aftermath, and I must say that Ben and his date look very snazzy all dolled up for their prom. If you and your family do make it out to our coast to visit SWSA, please do let us know over here (and depending on your consultation with Ben's doctors and specialists, if there is a celebration to be had DL magicmakers sure do know how to make moments). I, for one, and several other Disney lovers would be overjoyed to share the occasion (even if it's from a distance). I thoroughly enjoyed reading 3500. I couldn't put it down from start to finish! I laughed and cried and being a Disney nut myself, I enjoyed picturing each trip and the paths taken around the parks in my mind. Thank you for sharing your family with me. As a teacher working with children with Autism, I can relate to your ups and downs, but I wouldn't trade my kiddos for anything. They are each one precious and unique. Enjoyed the book, your commitment to Ben, and confirmed my love of Disney. The moment in the book that I was most struck by was your experience at Shands. While traveling in FL with my then 2 year old we ended up in a hospital ER with an ambulance ride to Shands. Our experience of hospital 1 to Shands was like night and day. The Shands hospital staff swarmed us and gave him the care he didn't come close to receiving at the 1st hospital. We will always be thankful to Shands for their medical care with children! Thanks so much for the updates. I have been reading your blog every so often, and got a kindle copy of 3500 for my birthday which I read through in a day, and promptly came back to your blog to see if there were any new developments. It is sad that he still misses Snow (the ride was a favorite of mine too), but as a big sister of a beloved brother with aspberger's, it always makes my heart happy to see the little victories like the ones you've mentioned in this post. I just read your book yesterday. I am going to shout. I LOVED IT!!!! As a former play therapist for kids with autism, your words went right to my soul. There were no favorite parts for me because every part was my favorite. Your humor and matter-of-fact telling of Ben's life made me fall in love with him. What struck me the most about the entire book was that your LOVE for Ben came shining through on every page - every single page. Thank you for sharing Ben's story! Please write another book!